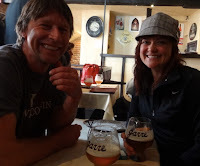 For my friends who keep asking me "I can't wait to hear stories from Belgium," I decided to finally write a few stories down on this last day of April before I forget them. In addition to these stories below I greatly enjoyed the cities of Gent, Bruges, Oudenaarde, and Ypres (leper). Tyne Cot and the WWI memorials were very meaningful. 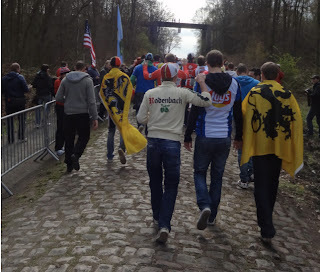 The velodrome in Roubaix was fun because I will always remember being there while watching the Paris-Roubaix from my home in the United States in coming years. 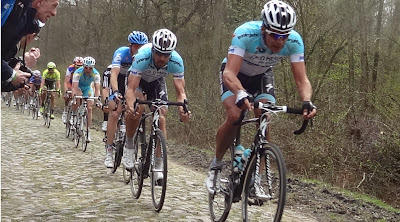 I will also remember being in Belgium the year Tom Boonen won both the Ronde van Vlaanderen and the Paris-Roubaix. 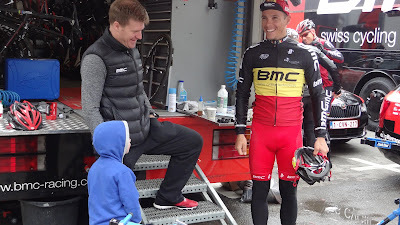 It was the morning of the Tour of Flanders, I had flown from Colorado to Belgium specifically to be a fan at this race (and the Paris-Roubaix the following weekend). 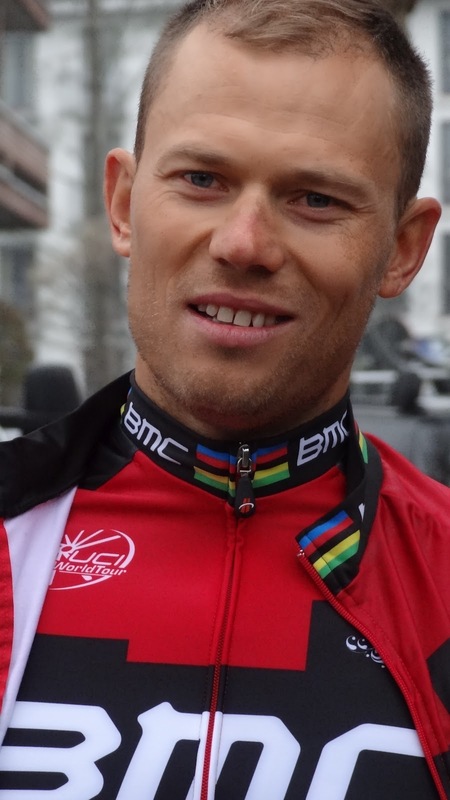 I didn't want to miss a thing, so I purchased a VIP Pass to the start in Bruges (Brugge). I was thrilled when I walked through the gates into the team area, I thought this is where I belong. I immediately began my typical "floating" as I call it, moving from one team to the next. Just then I caught site of some wildly dressed fans near the Katousha bus. Located on the outside of the fenced area, they were cheering loudly. Perfect photo op, I thought as I approached with my camera raised. The fans started going crazy chanting "Oscar Freire, Oscar Freire, Oscar Freire." Wow they are really hamming it up for me ... wait a minute ... something is up ... I turned around and standing directly behind me was former World Champion Oscar Freire (Katousha) with his typical smile and playful disposition and iphone raised high capturing the fans. He was loving every minute of it. We all laughed as I tried to step out of the way. (p.s. happy ending, those crazy fans were let into the fenced area shortly after). 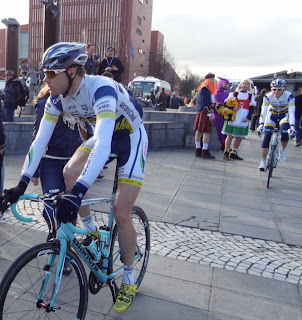 View images from the VIP team area at Tour of Flanders: Pedal Dancer Images. Enough said - great fun. A great big thank you to the cyclists and friends I met during my travels who added so much to my experience of traveling in Belgium: To Ernie who shared his enthusiasm and was in Belgium to join Velo Classics Tours, plus the other group of cyclists I met in the customs line at Brussels Airport and later saw on the Mur de Grammont that same day (Pedal Dancer: The Mur de Grammont); to Bobby Julich and Georges Lüchinger who allowed me to take images of team SKY and BMC; to Rich and Ricardo Hincapie and their friends for a warm welcome in Kortrijk; to Chris (from SRAM) and Maureen who sat next to me on the hillside of Kwaremont watching the Tour of Flanders; to Steve from Great Britain who gave me tips and stories from his own solo travels as a fan; to the informative guide at Tyne Cot who shared a free short history lesson about WWI; to Ken, Jaye, Kyle and Colleen who taught me how to truly enjoy a good Belgian beer in Bruges; to Gregg and Holly from The Chain Stay and their ever-flowing hospitality; to Jon and Matt who joined my niece and I on a perfect day at the Paris-Roubaix. Thank you. 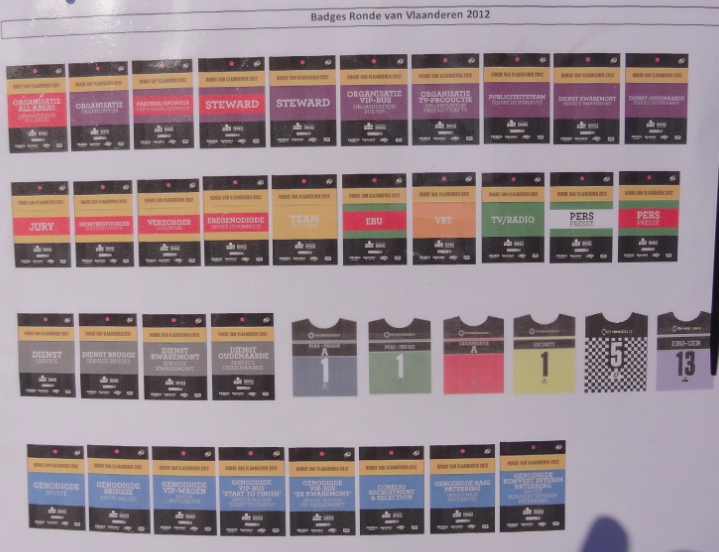 Arranging for the VIP pass through the organizers of the Ronde van Vlaanderen was an amazing experience and totally worth it. I had the pass sent to my hotel, it came with a map and parking permit and instructions (completely in Flemish) for €90. We started the morning with a fantastic buffet breakfast inside the concert hall next the t'Zand square. The entire market square was fenced off, unfortunately without a VIP pass, in Bruges you won't get inside the fence, making it is hard to see anything. Our breakfast was at 8am. Because we were there early, we had plenty of room to move around and watch the teams and riders get ready before the start blocks away at Markt Square (a different location, where you may also purchase VIP tickets to this specific local). Without a pass I would recommend looking from the outside in at t'Zand, then walking to the great atmosphere at the start in Markt Square. The t'Zand VIP area did get crowded by the time Fabian Cancellara and Tom Boonen emerged from their team buses inches away. It was amazing to see the looks of competitive concentration on their faces before the race - they were certainly ready for the fight. 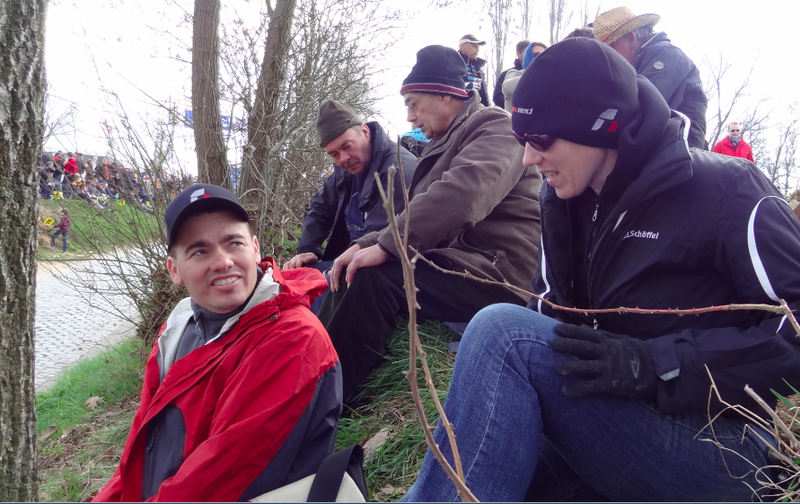 Being close to the riders in the morning made the afternoon of sitting on a hillside, along the Kwaremont watching the race, more meaningful and personal. 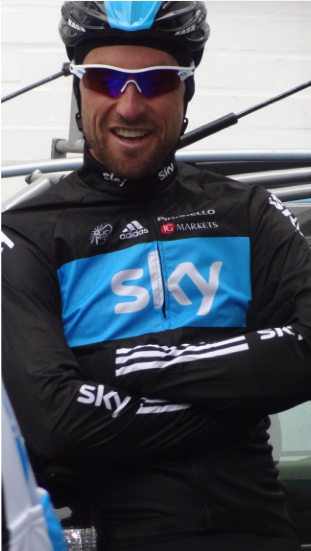 It was the perfect day in Belgium as a cycling fan. (Pedal Dancer: A day on the Kwaremont) See all the images from the team area before the start of Ronde van Vlaanderen: Pedal Dancer Images. 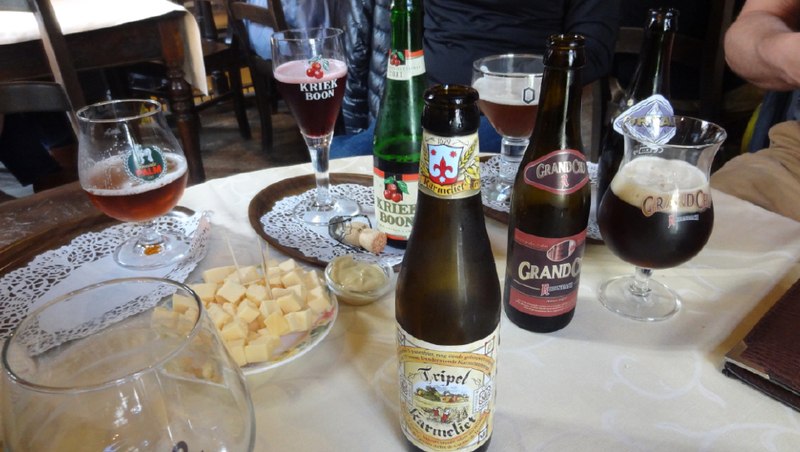 The appreciation of a good Belgian beer has stuck with me. My refrigerator has Leffe and Triple Karmaliet on it's shelves. 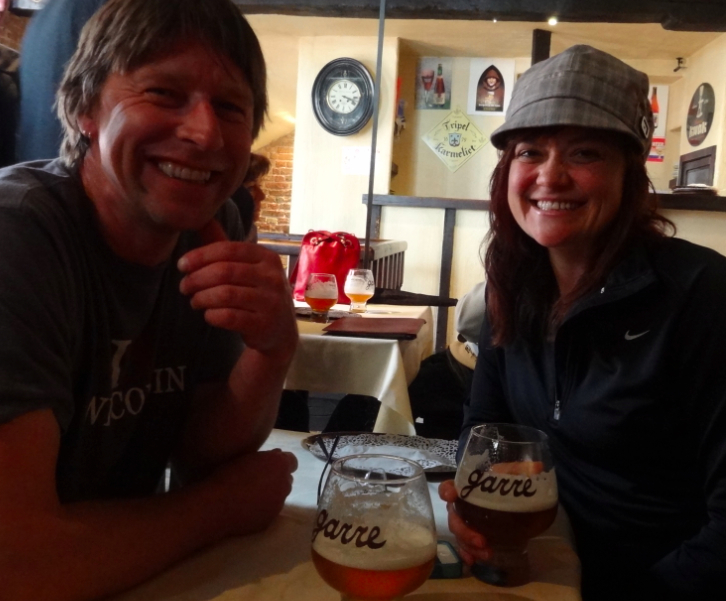 (Pedal Dancer: Beers in Belgium). I am forever a fan and a blossoming beer snob, someday I may return to drinking wine (hopefully rose, probably by July, while in France!). Reuniting with the simple pleasure of pedaling a bicycle has also stuck with me. Since I have returned to Colorado, I eagerly go for rides with friends. And through this pleasure, I have found a way to dig deeper and ride much harder than I have in a long time. I am also so pleased that I am finally healed! It took 15-months for me to heal from breaking my pelvis last year. I am happy to report that me and my completely new bike fit are back. 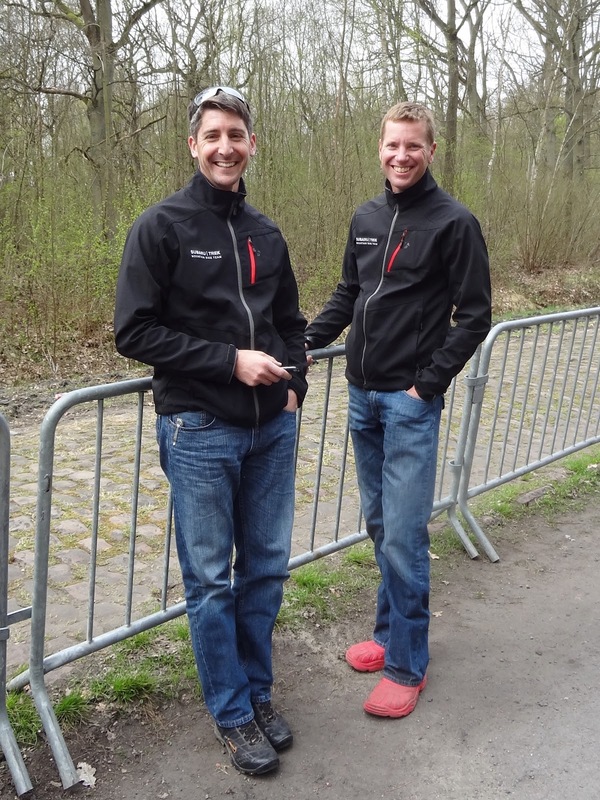 But as the Belgian fan in the Arenberg Forest related to me after wondering what I was doing there, "You don't have life-insurance, what do you call it life insurance?" "Health insurance?" I replied. "Yes, I have health insurance - you do not," he said grinning broadly, adding "but Obama is your chef!" Oh their impressions of Americans. (Pedal Dancer: A day of pave in France and Belgium). Ronde van Vlaanderen driving instructions (viewing in Bruges and 3-laps on the Kwaremont): To get to the team area start in Brugge, drive north on the A17 continuing all the way (it will feel like you have gone too far) until you see the sign for t'Zand parking, basically it is a turn off the autoroute and into the parking structure below t'Zand paved market. Note: the actual race start is from Markt Square. You do not need to worry about leaving before the start, there is adequate time, exit Bruge the way you came in (take the round about to turn around). Drive south on the A17 all the way to Tournai, this looks long, but the speed is fast and traffic free, (avoid national roads in high traffic times! ), connect onto the A8 heading east. At the second large interchange connect onto the N48. 8-10km up the road, look for the sign to Celles, turn left on the N391. Drive to the town of Escanaffles, turn right, follow this small farm road as far as you can with the large nuclear power plant and the river to your left. You may meet some children offering to park you car in a field (€3), you may continue past them a little further and park even closer. Park in a farm field or along the road where you see other cars. Follow the foot traffic (a few people) east to the Kwaremont. You will cross the large 4-lane N36 road. 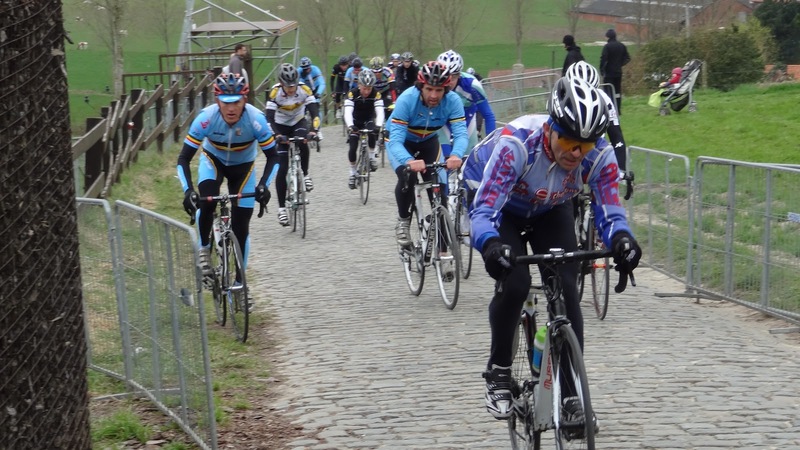 The Kwaremont runs parallel to this road 20 meters away and climbs from your left to your right. VIP tents and fences block some of the hill, but there is plenty of free viewing as well. There is also a beer tent area with large screen TV. 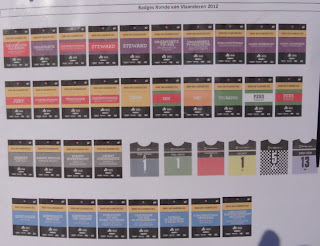 The route of the RVV should be the same next year. (Buy map: Geocart World Travel Maps #60 Provincie Oost-Vlaanderen, Tourist Special; and Buy map: Michelin Belgie #213). 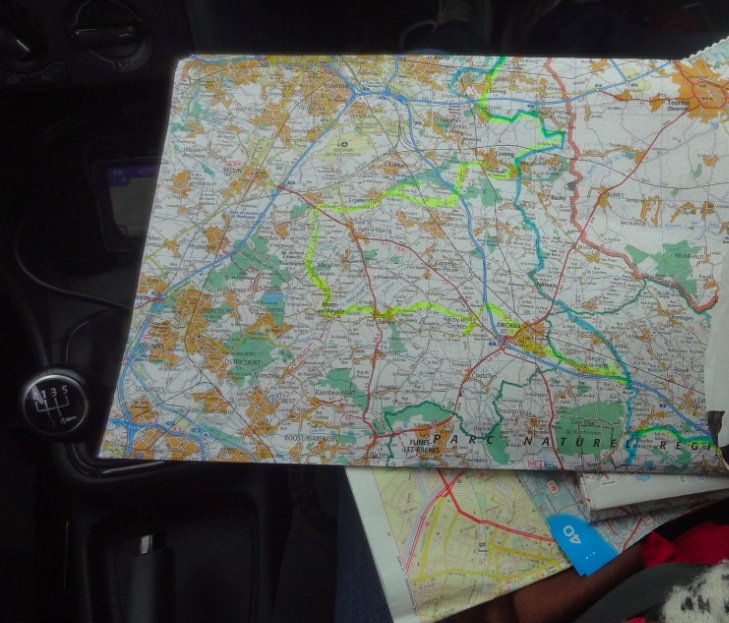 Paris-Roubaix driving instructions (viewing in Arenberg Forest and Carrefour l'arbre): Once you pass from Belgium into France, south of Roubaix/Lille, connect onto the large A23 autoroute. Continue south of the city of Orchies (at exit 2). You then have three choices to access the Arenberg Forest: Exit 4 will place you at the end of the Forrest where the riders exit; Exit 5 places you at a dirt trail where you may walk to intersect the first third of the forest (low traffic area, easy entrance back onto the freeway); Exit 6 takes you to the busiest intersection and the start of the Arenberg Forest (this is also where the beer tents, large screen TV, and performance stage are). You may easily walk the length of the forest, under the old defunct rail bridge. If you want to see the race pass over another section near the Carrefour l'arbre, get back on the A23 north, transfer onto the E42 towards Tournai and take Exit 3. Depending on the route (it changes every year), you should be able to park and walk (a long walk) to this famous sector of pave with more beer tents and large screen TV. 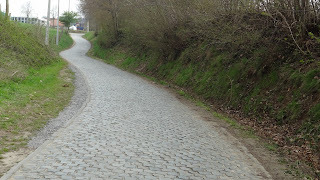 These 2 sectors of pave are almost always included in the Paris-Roubaix every year. Many fans skip straight from the Arenberg Forest directly to the Velodrome in Roubaix to see the finish in person, but be warned this city is congested, parking is difficult and car vandalism is seriously high. (Buy map: Lille Maubeuge #102, IGN Institute Geographique National; and Buy map: Michelin #111 Grand Lille; and Buy map: Michelin Belgie #213). How to plan your own trip to the Spring Classics: Recommended travel tips on traveling to the Spring Classics in Belgium as a fan. It is cold in Belgium in the spring, bring a couple good jackets and layers. Be sure to arrange hotel accommodations which include free wi-fi, and offer breakfast. Looking for a market to buy food? Look for these signs of grocery store chains: Delhaize (a sponsor of the RVV), Colruyt (Spar), and Carrefour (Champion), Aldi, Lidl, Cora, Match, Makro. Get and use a GPS device, but be warned it will not always get you there or take you on the best route. You still need good maps (recommended above). 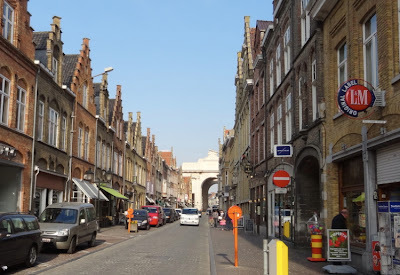 The most memorable phrase from my trip to Belgium was the GPS lady phonetically telling me daily, "Stay right on the slipstraught to England." I have no idea what she was talking about, but England was a longways away. 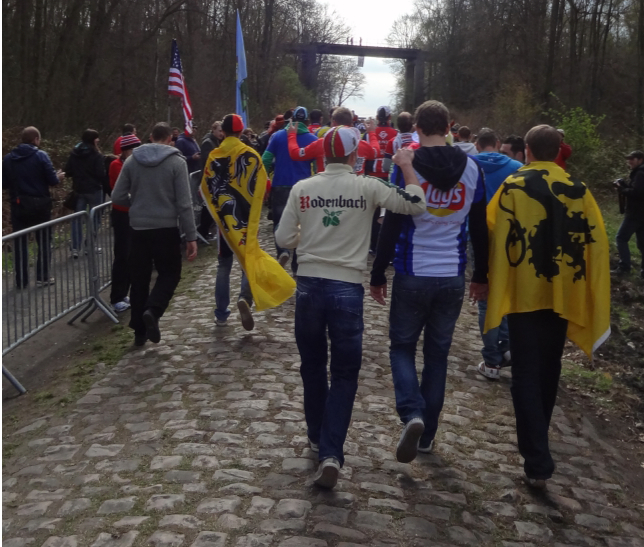 The Ronde van Vlaanderen (Tour of Flanders) and the Paris-Roubaix are completely different race experiences as a fan, absolutely stay for both if you can. You can also attend Scheldeprijs on that Wednesday in between these two races. I read Lonely Planet (good for smaller cities), Fodors, Frommers, Rick Steve's (very good for sites in Brugge and Brussels) guide books and googled like mad online to read anything I could find about traveling to Belgium. It all helped. But plotting the sites and points of interest (and bergs) on a map helped most of all. 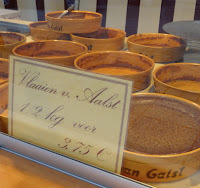 Belgian chocolates - buy them, eat them. Also try a fresh waffle, local beers, and any other local food specialties. Bring a beer opener to enjoy a beer in your hotel room. Bring your bike or rent one, the riding is absolutely doable, don't let anyone intimidate you from riding in Belgium. If you are not racing 140km, you will have a great time. Honorable mention goes to the gas stations on the autoroute, because they accepted my credit card, without a chip, at the pump! Plan on getting lost - a lot. Plan on wanting to go back - more than a lot. BartBikes.be there is also a good pro bike shop near Meerbeke. 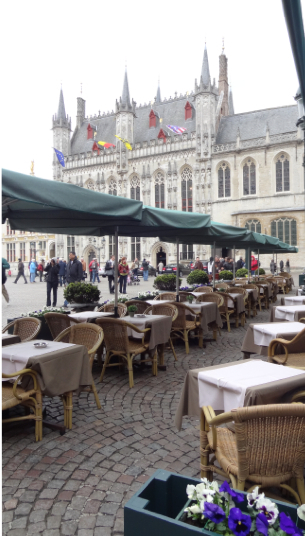 Frites stands in Markt square, Bruges - simply the best! Before you go: read about these blue disc parking passes (there might be one in your rental car). 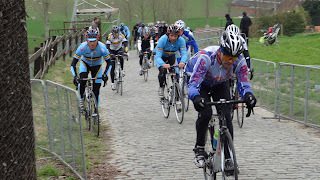 Day 2: Tour the climbs of towns of Tour of Flanders: Paterberg, Kwaremont, Koppenberg, etc. 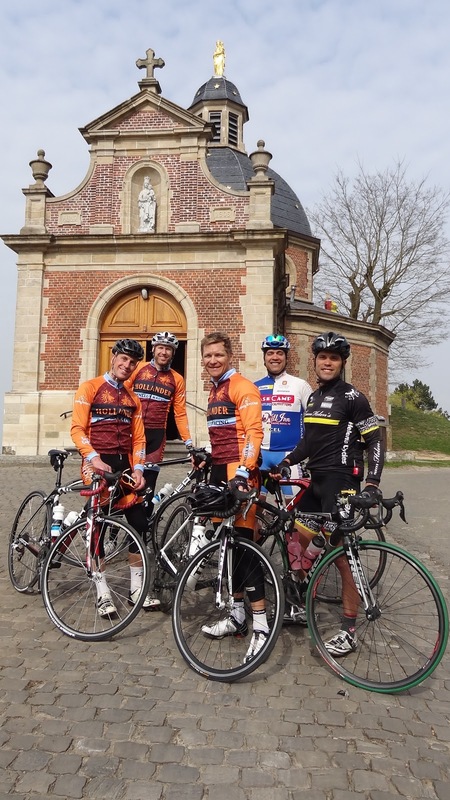 Day 3: (Ronde van Vlaanderen Cyclotourist) Visit the team hotels in Kortijk in the morning; Tourist day in Ghent. 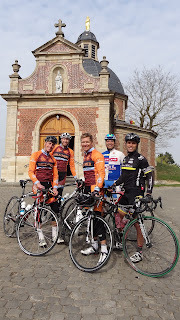 Day 6: Velodrome and clubhouse in Roubaix, drive pave sectors of Paris-Roubaix route, afternoon bike ride. 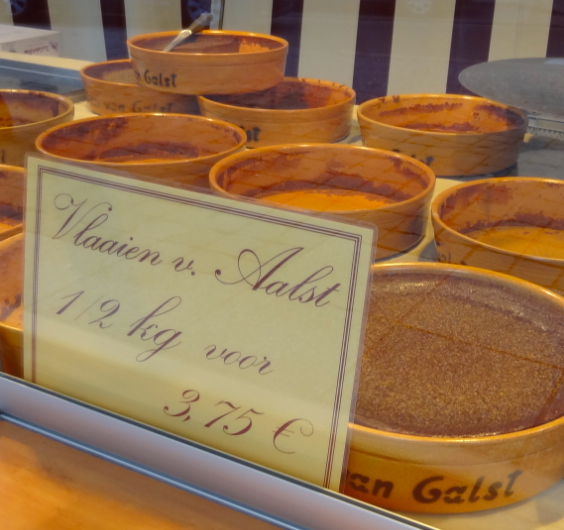 Day 10: Tourist day in Brugge - morning market and beer tasting.